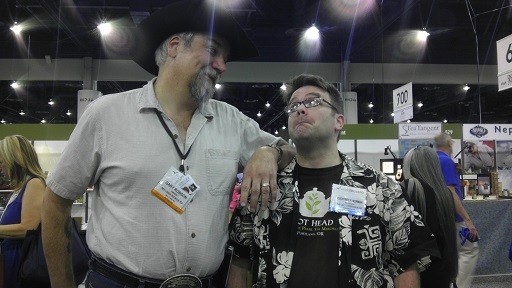 Yours truly with Geoffrey F. Norman at World Tea Expo 2013. Photo courtesy of Geoffrey F. Norman. Copyright Geoffrey F. Norman 2013. 2) It’s a good blog post. If you’re interested in tea and/or World Tea Expo, I recommend giving it a look. 3) It reminded me that I promised to send him a sample of Mr. Excellent’s Post-Apocalyptic Earl Grey and forgot in all the hubbub. Sorry, Geoffrey. I’ll get that on its way ASAP. 4) And, last but not least, he’s a perfect example of not blogging on a schedule! Posted on 26 June 2013, in Tea Thoughts and tagged earl grey, Geoffrey F. Norman, Lazy Literatus, Montana, Mr. Excellent's Post-Apocalyptic Earl Grey, World Tea Expo. Bookmark the permalink. 2 Comments. Much obliged for the kind words ,sir. In your defense, I hadn’t given you an address, yet. As soon as I know what my new one is, I’ll zap it off. Thank ya.